Looking for a bluetooth handsfree system? Want an Ipod interface for your car but your car doesn't have the ability to connect one? 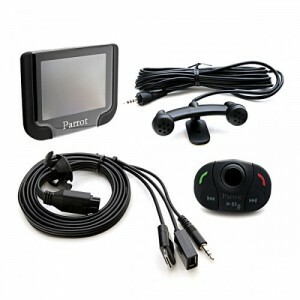 The Parrot MKi9200 is more than likely the product for you. Easily installed to at least 80% of cars on the road at the moment. Where to start. Well lets start with whats in the kit and any extras you may need. 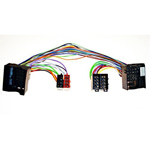 The Kit itself comprises of: the Main Control unit, Main wiring harness, Dual Microphone, Remote control, Steering wheel strap for remote, Visual Display and Auxillary interface harness. Fixtures, fittings and documentation. Generally on most vehicles you will need a S.O.T. lead (Sound On Top), these are specific to the vehicle. Believe it or not you NEED to know the answers to these questions. If your car audio system is Harman Kardon or Bose you are going to have problems installing this kit from the word go. You will understand why if you continue reading. 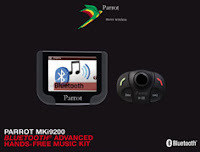 About the Kit, the MKi9200 is a Bluetooth handsfree kit primarily, with 4 auxillary forms of music input. 1. Dedicated Ipod/Iphone interface - This also charges the Ipod/Iphone. 2. 3.5mm Headphone jack - Allowing regular music phone or generic MP3 player connectivity. 3. Standard USB - Allowing connection of a flash drive. The phonekit works exactly the same as the Parrot CK3100LCD, pairing of the kit to the phone is very simple in most cases. Go to connectivity menu on your phone, go to bluetooth, makes sure bluetooth is switched on. 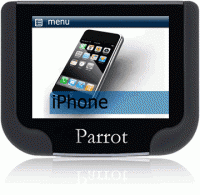 Next search or add a new device, your phone will now search for the Parrot kit. After a few seconds the kit should appear in the device list and will show up as Parrot MKi9200. The only phone I have come across lately that doesn't ask to automatically connect is the Iphone. It does still connect automatically though. Most phones will sync the phonebook automatically including the Iphone and HTC Desire (Provided the Kit is loaded with the very latest Parrot Firmware). Some phones don't which means you have to send the contacts to the kit via bluetooth, if you can select all contacts and send via bluetooth do so the kit will accept mutliple bluetooth contacts. If you can't select all then unfortunately you will need to send the contacts individually, time consuming so do the important ones first! Basically people blame the kit for this, but it's actually the phone manufacturers fault as they haven't used the standard V-card protocol that everyone else uses. The remote control is simple to use, spindle volume control/menu manager/Enter button in the middle, green/red answer/end buttons, Fast forward and reverse buttons and a Play/pause button. The Display is approximately 7cm by 7cm and is Hi Res full colour. The Display also contains the SD card slot on the side. All the functions of the phone kit are displayed here. Caller ID, menus and all the auxillary functions are controlled from this display too. Including the Ipod play functions. When in Ipod/USB/SD card music, the ID tags will be displayed, including Album, Artist, Track, provided this info is recorded with the tracks. The whole system is very intuitive. All Ipod functions are as expected, select from playlist, album, artist, track, podcast or audio book. If you are using a music device on the kit of any kind. The phonekit will overide all other functions allowing you to take your call with all music muted. When the call ends it returns to the music. The Kit itself has a built in 4 x 20 watt amplifier, the kit takes over the speaker system in the car as it does with the phone call, for all the audio functions. Now this is why people with Harman Kardon or Bose are going to have a problem. Modern HK or Bose uses MOST (Media Orientated Systems Transport) or Fibre Optic to you and me. This is why your problem exists, you can't put a high powered amplified signal into a power amplifier. At least not without causing damage. The only way you will be able to use the Ipod/Memory card ports is change the output from the MKi9200 into a Pre-amp MOST signal. Now there is an interface just become available that allows you to connect the kit via the Fibre Optic MOST system, thus giving a clean amplified signal to the speakers. The interface converts the Line out pre-amp stage of the Parrot kit into a MOST signal. Right just so we are on the same page, this interface is NOT cheap, it will cost you somewhere between £220 to £250 to buy retail. Some people will say you can use the pre-amp to the aux-in on the Radio, yes you can, however because its not a full signal and pre-amp, it will be quiet. (Not very loud!!) which some people may find acceptable but a majority won't! I've been there, got the tee-shirt. To be perfectly honest, I wouldn't accept it either. The other one is to use the phone input on the Radio, E.G. Volkswagen. Yep thats fine if you want a dual mono signal, its not even stereo! So in summary, if you have HK or Bose theres really only one way to go, the MOST interface, if you want good quality sound, that won't damage the HK or Bose system in the car. The only other thing you will see visually is the twin microphone. The twin mic allows extra pickup for calls and greater voice clarity thus making it easier for the caller to be heard. Please take note, if your Parrot MKi9200 does not show 'Goodbye' on the Parrot display when switching off, it is NOT installed correctly. It means your ignition and permanent live feeds are around the wrong way. This will cause problems with pairing. Not at the time but later, especially if you find your have to re-pair the phone to the kit on a regular basis. The kit will only allow 8 phones in the connect memory. Once it is full you won't be able to pair any more phones to it. 2 ways to solve it, delete all previous pairings from your phone and the kit or have the lives swapped around. Would I buy one? Yes if Ipod functionality was a solution I am looking for and wanted to keep my original car radio. Is the MKi9200 User friendly? Yes very much so, you certainly don't need a degree to operate it. However reading the manual always helps. How much does the MKi9200 cost? It varies online so I can't give an accurate price. However a Parrot dealer would probably charge between £249.99 and £299.99. If it's cheaper than that, then don't expect the installation to be that good. My opinion of this kit, very very good. I haven't found a phone yet that won't pair to it in one way or another. For many of the Volvo models from 2007 onwards, if you have high power or premium sound and your amp is located under the drivers seat (UK Models). You can buy an amplifier bypass lead. Even though the system is MOST you can still get the MKi9000, MKi9100 and MKi9200 to work with these cars without any problems at all. I recently bought an XC90 from Motorhouse and asked for the top of the range parrot to be installed. I asked the salesman to check with the installers if there was any way that this Parrot can be interfaced fully into the car more in line with factory fit. The salesman checked and came back and said no it can’t be done. I have just stumbled across two threads on the internet that show two different ways of achieving a much better outcome with this car / kit. So I may be wrong but are there things here that your installers are not aware of? I would like to discuss this with someone in the installers team that is technically knowledgeable about the Volvo set up and the full options on a parrott – I would liek to think that this Motorhouse will try to help fix this problem. Yes, there is an interface available from a good friend of mine, Steve at In Cartec. The part number you are looking for is 10-810. This is a MOST interface that utilizes the pre-amp stage of the Parrot MKI9200 kit. It uses the Volvo MOST amplifier rather than the 4x20w amp in the Parrot kit. Because this interface uses the volvo amplifier you will get full sound from all the speakers. You should be able to buy this interface from a local audio specialist or direct from In Cartec. I don't know the price but would not expect it to be cheap. I was looking for something good and affordable and i found Parrot product. Quality is amazing and price very reasonable. I will suggest this to all my friends. This is cool gadget for cars. Hello Richard. I have a question about the MOST bus incompatibility. When I look at the wiring diagrams of MKi9200, using the ISO connection options, I see that the MKi9200 appears to take the output from the factory MOST Bus stereo (that would've gone into the speakers) into its main body, and then spits out a set of speaker output itself. I would imagine then that when the Parrot unit is inactive, it would simply act as a pass-through, allowing the factory headunit's output to be passed onto the speakers. It would follow that when the Parrot unit is active, it would essentially severe the factory headunit output, and send its own output to the speakers instead. Therefore factory MOST or not, it doesn't matter. The factory unit is essentially disconnected from the speakers when the Parrot is in active use. Your understanding of MOST is incorrect. MOST is a Fiber Optic ring that transmits the audio or video signals around the vehicle. It is used because the transmission speed and no interference. However the MOST Signal is normal a pre-amp signal which means it has to be amplified by something. You can try your method if you want however I will guarantee that it won't work or will not work properly. This is all dependent on the vehicle having a separate amplifier to drive the speakers, be it Bose, Harmon Kardon or as now fitted into Audi's Bang and Olufsen. I have over 18 years experience in this industry so I have a pretty good idea on this subject.. Thanks for your effort that you made for this blog. I am driving a BMW 1 serie 118D from the year 2004. And i am verry happy with it. But the problem now is, that i have also a Parrot MKI9200 with bose sound system and a steeringwheel with buttons. Is there any guide on the internet how to configure this? No that's not possible. 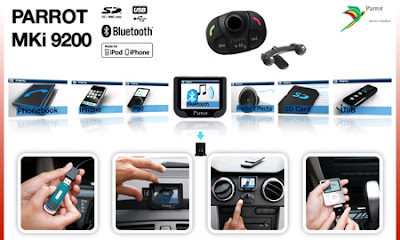 Only the CK3000 and CK3100LCD can interface with the buttons on the steering wheel and even then it is only the phone button and volume up/down buttons that work. If you were to interface the MKi kits you would lose the ability to control the iPod/iPhone music control. Hi, I have recently removed a Parrot 9200 kit from my old car and whilst having the new one serviced asked the garage to fit the kit using a new wiring harness I purchased off ebay. The unit will not power up however there is power to the blue box. Can you give any advice? Thanks. Hi Adrian, What car is it? Might sound silly but do you have power on both the red and the orange wires on the kit? Carefully check all the connections on the blue box and make sure they are pushed firmly home. Also check the ISO harness that comes with the kit and make sure all the pins are seated correctly (they have been known to push out slightly and not make a proper connection). Lastly make sure the screen is seated properly on its mount. Some modern cars don't have an ignition live at the unit so it would also help if I knew what car it was, from this I would be able to tell you if your car has the ignition live or if you need to put one in. Hi Richard, thanks for the info. The car is a Porsche Boxster (2008) with PCM but no BOSE. Hi Adrian, on a 2008 Porsche Boxster, you will more than likely find there is no ignition live at the back of the PCM. Generally even though its a non-bose system, you will probably find an amplifier under the black cover in the middle, towards the bulkhead of the front bonnet compartment in between the front struts. However I don't believe this will be the problem. I think you just don't have an ignition live. You can find a good ignition live to run the kit from the fuse box in the drivers side kick panel (RHD or UK vehicle, passengers side if it's LHD or european). Thank you for your help. I'll pass on the advice to the garage and get back you you with the results. Hi Richard, could you please shed some light on the way the OASi MOST interface with MKI9200 transmits its signal thru a BMW 2009 Professional radio ie AUX, CDC or other the OASi unit shows its conn to MOST & communicating with MKI9200 but nothing coming from HU. That would be correct, basically the MKi kits take over from the headunit. The kit has a pre amp stage that interfaces with the MOST amplifier and it drives the vehicle amp without using the headunit. All your control comes from the remote supplied with the kit. If you are just using the car radio and the phone rings, again the kit will take over the system for the phone call then return to the radio for normal operation when the call has ended. You would normally only require the OASI MOST interface if you have the uprated Harman Kardon system fitted to the vehicle. Hi Kenny, Firstly apologises as I have managed to delete your post. both the pioneer and the mki9200 have the noise cancelling microphones. The only difference is the mki kits have a dual pickup microphone and the pioneer has a single microphone. If money is not really the issue, then it's down to whichever extra features you are looking to get from the unit you want to fit. Personally seeing as you have the HTC ONE, i'd probably go for the pioneer as you won't get the full benefit of the mki kit as it is mainly aimed at iPhone users. I would suggest looking at one of pioneers double din units such as the AVH-X2500BT or AVH-X3500DAB. Both these units are Android compatible with the extra Android lead available from pioneer. This lead activates advanced app mode which enables the unit to do what is known as mirror link. With the android navigation for example, it will display full screen on the pioneer unit. Along with other apps such as Youtube or Tunein radio. You would need to download the pioneer app radio app from the google play store, it's free and will recommend all other apps available to you. I would check with your local specialist as they will be far more knowledgeable than your local halfords. You could also check on the Pioneer UK website to check your phones compatibility with the units. To my personal knowledge the Pioneers are compatible with 2.3.6 GB, 4.0 ICS and 4.2 JellyBean android OS's. Hope that helps, let me know if you need more info, I'll reply as soon as I can. Thanks for that..when isa I'd money was no option, I think I'm being a bit naive, the ones u mention cost circa600£. Halfords are doing some double dins at half price....is the Sony XAV 601BT any good....or the other one that have at circa300£ is ken wood DDX 4023BT. I'd happily ask youth fit it if you were near evesham. Hi Kenny, not sure where you are shopping but the x2500bt is 299 retail and the x3500dab is 399 with the dab aerial included. the android lead for both units is about 50. Don't like the sony personally, I would be more inclined to go with the kenwood. Thanks Rich and yes decision made. i saw the 3500 at Halfords for £600 and then saw on Amazon for less than £300!. so I'm going for that. The only issue being it says it has a single microphone and the MK9200 has a dual microphone, hope it doesn't lower the call quality which is key for me, particularly for the listener - any views?. On pioneer website also says android is compatible with the 3500 apart from 2 things - app radio and Video. I can live without that I guess. Just hope installing this doesnt mean loadsa firmware updates all the time as life is complicated enough and am guessing when you do a firmware update it restores factory settings and wipes any settings. will this be low maintenance - i hope so. either way, have really appreciated your help. Kenny, fit the microphone in the middle by the rear view mirror not off to one side. It will work much better than by the window. I have personally not had to update any of the pioneer units I have supplied with new firmware to get them to work with any phone. Are these two identical cables? Because the aerpro company said that this cable will provide music to all speakers? If not what cable to I need to connect to my Mazda Bose to my parrot mki9200? I am new to this blog and I need some advice on the following. Installation of the above kit to my Honda Accord 2005 with built in satnav. The problem I have at present is, it cuts out the voice prompt form satnav. Would appreciate any help on this matter please. Have bought a second hand Vauxhall zAFIRA with Parrot mki9200 already fitted but when the radio cd is on it only comes out of one speaker any suggestions? Lucas, I believe the interface you are looking for is available from a company called connects2. I believe the part no: CTTMZ001 should make the MKI kits work with the Bose system in you car. Marina, couple of questions. Does the Parrot MKI play music through all the speakers or is it the radio/cd that comes out of one speaker? If it's the Parrot that only plays through one speaker and which speaker does it play through? Does the radio/cd play on all speakers? 1 Parrot may be wired into the phone connection on the radio, normally on a Vauxhall it would just use the drivers side speaker for phone operation. 2 Loose or unplugged connections on the parrot kit itself. 3 Possibly in need of a software update but I very much doubt that one. I'm looking to put this kit into a 2009 Audi TT with a Symphony (I think) head unit. Do you know if I need any additional parts aside from the kit itself? And, is there a reputable installer list covering the Glasgow area that you know of? I have a 59 plate sprinter van and am looking for my first decent Bluetooth system. It has the standard radio system in it. I am a bit put off by parrot as my other half used to have one in her passat but it was not overly clear/loud. As the cab is quite big I am worried about spending £300 ish and it not being clear enough and picking up background noise. Any ideas recommendations would be appreciated. I installed the MKI9200 in my Lexus GX470 via harness kit. Everything was working perfectly for a few weeks and then bam----->all of a sudden no sound is coming through the speakers despite the device visually running fine. It also ceased turning on and off with ignition powered up/down and is always live regardless of car being turned on. Also, my radio now turns on without power as well as my cigarette lighter, clock and other items in the car that only worked with the car on previously. again, this was working smoothly until a couple days ago. any help would be extremely appreciated. @Paul, you should be fine in the sprinter, have not had any problems sound wise with any Mercedes Vehicle. It sounds to me like the other halves VW would have been using the VW telephone input on the back of the factory headunit. You a massive reduction in sound quality plus it normally only uses the front speakers. Apologies to all for the lateness of my replies, I have been really busy working on some show VW T5 transporters.